Our Dancers learn the STDA syllabus for Highland Dance. There are generally 2 exam opportunities for dancers to demonstrate their skills to an examiner (usually from Scotland) every year. Exams are usually held in November and then again in February. Pre-school and Primary dancers have the opportunity to participate in the “Dance Stars” program which allows them to prepare for their exams in the future by performing basic highland movements in front of the examiner. The requirements for all Highland Dance exams are listed below for your convenience. A current PDF copy is available [here]. Study Help for Your SDTA Theory Exams! 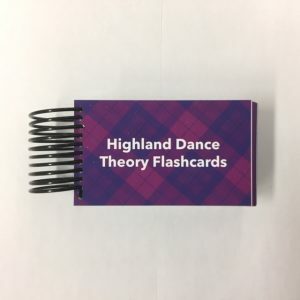 Pass your highland dancing SDTA theory exams with ease by studying with our custom flashcards. Coil bound and colour coded, they cover all grades from primary to Grade 6. Positions are shown in full colour and sword positions are diagrammed. Click on the flashcard photo to be taken to the Celtic Ceilidh online store where you can pre-purchase and then pick-up when you go to your next dance class. Hands taken from 1st Pos. to 3rd Pos. and back to 1st Pos. Point close from 1st Pos. to 4th Pos. Spring Points in 4th Pos. Note: Teacher will select 5 movements from above list. Point close 1st Pos. to 2nd Pos. Arms to 1st to 2nd Pos. back to 1st Pos. Note: Teacher will select 3 movements 3rd test and 3 movements from 4th test.